Create your own route on Jackson’s streets. A fun way to explore this historic town, it’s easy to put together a few miles on some of the main streets and side streets of Jackson. See this map. The quieter streets are bound by Gill to the north, Snow King Ave. to the south, Milward to the west and Racher to the east. Elk Refuge Rd. It’s possible to run for several wonderful miles along Elk Refuge Rd., which leaves the town of Jackson just off Rancher Rd. to the east. Run along this quiet road, with views of elk and the mountains. Multi-use Paths from Jackson. See our other post for a list of all the major multi-use paths and trails easily accessible from Jackson. 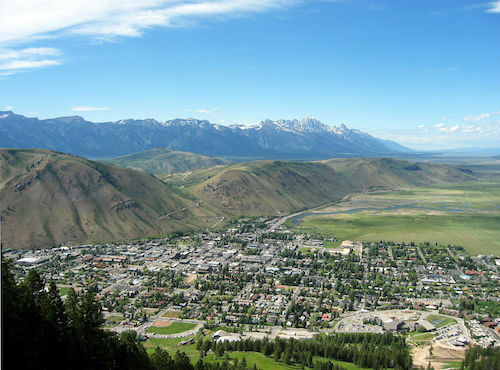 You can run south to Game Creek, west to Wilson, or north toward Jackson Hole and Grand Teton National Park — all off road!